I trust you’re all doing well? What an exciting week it’s been in the world of politics, ey? I am excited to tell you that everywhere you turn in Nigeria today, folks are busy talking elections and sincerely, there is far too much drama for anyone to turn a blind eye. Cases in point are the State Governors who are foisting candidates from other parties on their citizens. I am still at a loss for a description for Governors Ibikunle Amosun and Rochas Okorocha of Ogun and Imo states respectively. Then President Muhammadu Buhari decides to boycott the Presidential debate, just as former VP Atiku Abubakar sees no reason to debate with the other contenders when the big fish has refused to turn up. Nigerians are seriously divided on this with different reasons in support of or against the actions of the two key players in the forthcoming elections. “The President should not have boycotted the debates, it only goes further to show that he has no regard for Nigerians”, Obinna said. Another guy I met at the bar said, “it doesn’t matter whether PMB shows up or not, it is not about how much you can talk but how much you can deliver”; from the next table, Akin could not hold his peace as shouted back, “and what has he delivered o, Mr. Buharideen?”. “Go and see how far they have gone on Lagos-Ibadan expressway, the new rail line passing through Abeokuta or even the Second Niger Bridge, Oga Atikulated”. At this point, I knew I had to change the subject. Hardly had I arrived at Aare Oladeinde Ariyo’s apartment when he started on the President’s performance at the Village Square Meeting, hosted by Kadaria Ahmed. He was clearly unhappy about the performance citing a point where Kadaria had to admonish the Vice President to allow the President to answer his questions. There have been so many angles to this as well, a friend of mine who believes so much in the Buhari government, said that it must have been due to fatigue, another posited that Buhari is Nigeria’s Moses, and VP Osinbajo is his Aaron, if you know you know. He went further to say that what is happening in Nigeria today is similar to what happened in Israel thousands of years before Christ. This is an indication of how creative we are in Nigeria, we either make a joke out of the situation or just adapt without much ado. 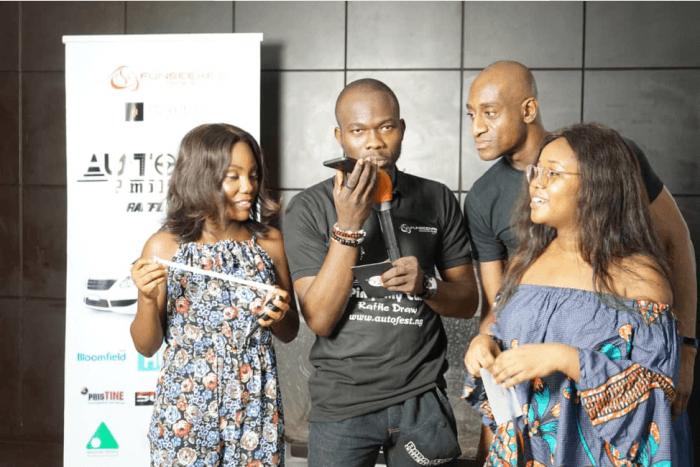 Down to Autofest, Babajide Ogunnoiki of Funseekas Ent Network, a friend, had come up with an idea to help people upgrade their vehicles at a minimal cost. For one thousand-naira, five people will have their vehicles pimped by industry leaders. Anchored by Babajide Gurero, the following guys’ tickets were drawn in the raffle; Gregory Michael, Haruna Mohammed, Kehinde Ehinenk, Mowarin Fatima, and Kazeem Dosunmu. Their vehicles will be transformed in the next couple of weeks. On the intellectual side, I got a chance to attend the inaugural workshop of the African Action Research Community, initiated by PaxHerbals Clinic and Research Laboratory, Lagos. The convener, Rev.Fr. Adodo, spent years thinking about how to move Africa forward. Discussions held, papers shared, but not a lot of action taken. There were various contributions and the conclusion was that it was time to take action. Bolanle Alabede, the moderator encouraged everyone to bring their ideas and projects forward for possible collaboration. My take: bring it forward indeed and if you can’t, bring it to life however you can. Enjoy the rest of your week and remember to do one act of kindness, whenever, wherever.